This is a post that gets me really excited. You see, back in the start of my stage lighting career, I was also interning at my church, playing around constantly with different lighting design ideas and being mentored by a great technical director. One of the valuable things I learned in this period of time was how to do special event lighting at my church. It first started with adding some pizzaz to a youth dance fundraiser, but then it spawned the idea of doing “not only for profit” work, setting up event lighting for events that were already renting the building as a affordable extra fee. If you are like the average contemporary/modern church, you probably change your set design monthly or so, and the lighting with it. You’ve probably amassed a small pile of LED fixtures that you light set pieces and band members with from the floor. At any given time, you may have a few to a bunch of free LED fixtures and fixtures on the ground of your stage. Want to use them to earn your church some extra money using them in their down time while, at the same time costing no extra money for the church? Wedding uplights can really transform a space! LED uplighting has gained an amazing amount popularity in recent years. LED fixtures combine cost-effectiveness, ease of use, safety and versatility compared to the old option of conventional par cans as uplights. I remember when I first started in this industry and constantly ran tons of cables to big power distribution panels just to have super-hot lights that weren’t even that bright in deep colors. You couldn’t change the color midway through the evening, and the conventional par cans could burn people, walls and carpet if they fell over. Technology has definitely caught up to speed with demand for uplighting ability. Uplighting is the “in” look for weddings, and is incredibly simple and cheap to make it happen. You probably already have the equipment needs: it is as simple as LED lights, extension cords(black preferred, green okay, orange is cheesy), and some gaff tape to keep it all safe. The most basic version of uplighting involves you putting your LED fixtures into static color mode and setting the color picked by the wedding party. Then, set up each fixture, pointing up against the wall and tilted so that the beam is even from about 4′ off the ground to the top of the wall but not splashing too much onto the ceiling. Space the fixtures evenly, and experiment with how it looks to place extra fixtures at the entrance, behind the head table, etc. There really are no hard and fast rules in this game, just do what looks right and what catches the eyes of your client. When you are focusing the light, try not to look into the fixture much- you’ll just blind yourself. If you want to get more interesting looks, try DMX addressing your fixtures and using your lighting console to program them. 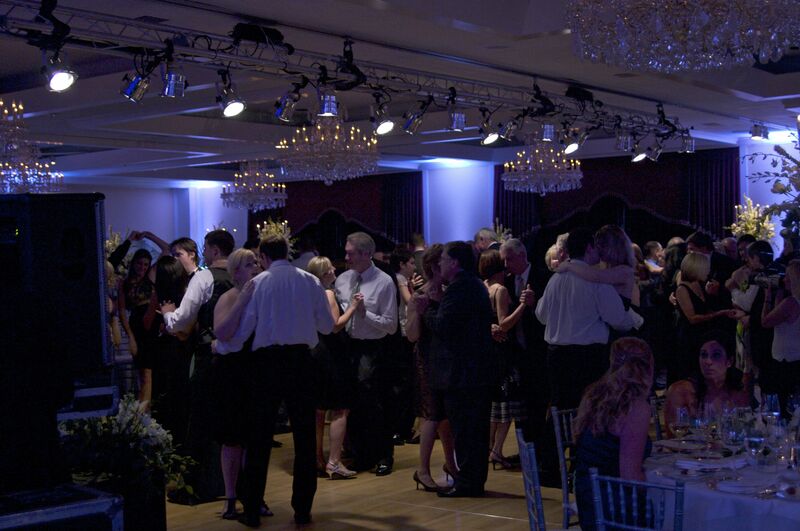 This way, you can change colors by fixture as the night goes on to match the mood desired by the event coordinator. Just picture the first dance with softened, dull colors to keep focus on the bride. Then, change to a rhythmic flashing pattern as the new couple shows off their moves! With DMX, you can make these changes subtle or extravagant- or both! What are the Business Nuts and Bolts? From Peter Castleton on Flickr. You can play around with lights all day and have loads of fun. But now I want to make a subtle transition into the business of this concept. I believe that this wedding uplighting is a simple add-on to any wedding package your church is already providing to create a “not only for profit” business. With event lighting, you can generate a profit for your church to use for any specific purpose, whether that be missions, facility needs, new equipment purchases or something else. You can employ congregants who need a extra income with just a little training. It truly can be a small business that is for so much more than just profit. Let’s look at the numbers for setting up 10 uplights that we can charge a below market fee of $200 for. In my market, you can’t buy this simple service from an outside contractor for under $400. $200 is a steal! As I mentioned above, this isn’t a pushy sales pitch or anything like that. In fact, as a technician, all you really have to do is demonstrate the possibilities to your church’s wedding coordinator, build a fee schedule and he/she will sell it. Then, either you can do the labor yourself or help someone else by training them and giving them the work. You don’t have to follow my labor cost of $20/hr if it is a bit high in your area. The great thing about this concept is that you are helping so many people through a simple business concept. You help your church have more attractive “premium” wedding design. You help raise money for your church, and you help congregants who need to money. And you help the wedding party by providing a quality service at a price that you can’t beat! It truly is a “not only for profit” business! Part 2 of this series continues on here with even more ways to use event lighting for fun and profit in your church!